Late dinner - how to keep it healhty? Late dinner – how to keep it healhty? In this busy day and age it’s not uncommon that we find ourselves working till late and having a late dinner. It could be simply due to a late shift or during those crunch moments when we really need to finish something like the last week before the delivery of a big and important project for work. Often when we work late it’s hard to maintain a healthy diet and meal times get pushed around at the expense of our health. Everyone has had those days when you get home at 9 or 10 pm, so hungry … or not… because your stomach literally stopped screaming at you and just rolled over to sulk in it’s own emptiness. Often we pick the easy way out – raid the vending machine at work and buy a frozen pizza or lasagna or quick Asian takeout as we make our way home. I usually felt guilty, even upset at myself for yet again not doing the right thing and eating healthy as I had promised myself I would do. But why is having a late dinner not healthy? Our bodily functions are per-programmed according to natural circadian and metabolic cycles. Essentially, at night our metabolism naturally slows down, our body uses less energy and organ function slows down. As digestion requires energy and good digestion requires full functionality of our digestive organs and liver, when we eat in the late evening digestion is less efficient and commonly associated with indigestion, weight gain and other negative consequences such as depression and low self-esteem (1). We are just not programmed to have a late dinner. Studies on mice have well documented the correlation between weight gain and late night eating. See (2) and (3) for examples. Studies on humans have also shown positive correlations. A study published in the American Society for Clinical Nutrition that studied weight gain among 94 day and night time eaters found that nighttime eating was able to predict weight gain (4). A study published in the journal Nutrition on weight gain prevalence in workers on late shifts compared to those on day shifts found that among the 85 subjects, “the late-shift group reported a mean weight gain of 4.3 kg, which was greater than the mean weight gain of 0.9 kg for the day-shift group”, bringing them to the conclusion that “reported changes in eating … may contribute to the increased weight gain of late-shift workers” (5). Furthermore, a study published in the journal of Obesity which studied role of sleep timing in dietary patterns and BMI among 52 participants found that “calories consumed after 8:00 PM predicted BMI” and their findings indicated that “caloric intake after 8:00 PM may increase the risk of obesity”. This makes logical sense when we consider the natural way our digestion and metabolism work. When we eat food, it is broken down and digested. Glucose enters our blood stream and becomes available for bodily functions requiring energy. Normally we would burn up the glucose in our blood through activity, but in the evenings when we are not as active and our body functions are naturally lower, the glucose is converted to glycogen and then fat. This fat will be distributed and stored in different parts of the body and it just so happens to love hanging out around your intestines – giving you a belly. In addition, due to the fact that late night eaters on average also eat more in terms of calories(6), it’s not surprising that they gain weight. It’s important we keep this in mind and plan ahead if we want to maintain a healthy body whether it’s just for a few days when working late or for the long run if we landed a job with the the late shift. What can you do about negative effects of eating a late dinner? 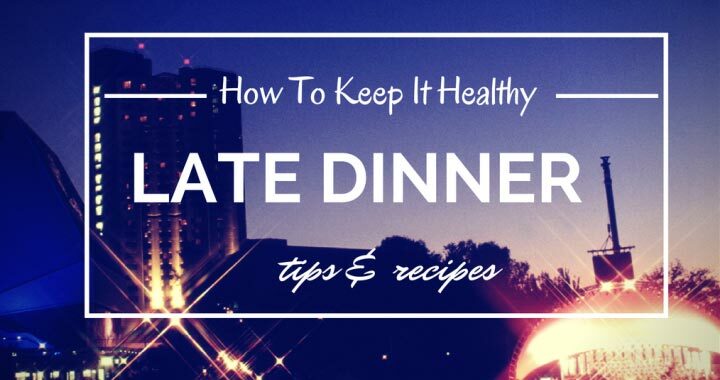 In the spirit of keeping ourselves healthy, I have come up with a few solutions that will help people who regularly eat a late dinner maintain, if not lose weight and stay healthy. We all know that motivation is lowest at the end of the day, so the key is to be prepared. It’s better to wake up earlier and get more work done during the day rather than work late and wake up later the next day. This strategy better aligns our natural cycles with our working needs and is thus much less stressful on our bodies. So on those crunch days, get up earlier in anticipation of the extra work hours you will likely need. However, if it’s not possible to wake up earlier, because you might be working with a client in another time zone or you are on the late shift at work, try one of the following strategies. If your work schedule starts after lunch, forcing you to work past dinner right into the evening, you may as well switch things around. Instead of dinner being the main meal where you have that tasty, delicious steak or multi-layered veggie burger made of fairy light itself, why not have it for lunch and make dinner the smaller meal? Make sure that you make your lunch enjoyable so you are satisfied. After all, what is it that we look forward to in a meal? Is it not satisfaction – the almost divine feeling of “aaaaah, that was good”? We are so used to packing lunches for work, why not pack dinner for work. Make yourself a simple sandwich or pack some leftovers and eat them before 8:00 pm. The key to good leftovers is to cook enough to have leftovers. Also, not all meals make good leftovers, for example you wouldn’t want to have leftover steak as it would just end up dry, but things like leftover whole grain pasta or a salad or veggie burger paddies make great packed dinners. Now keeping things healthy also means we should keep a few other things in consideration. Your meal should be nutritious, you shouldn’t over eat and you should be careful with how you combine your food. The last thing you want is to have that awesome lunch, only to feel tired afterwards and/or miss your meeting or shift because you fell asleep. If you would rather have a small late dinner when you get home, you can always pack a snack to keep you going past your normal dinner time and have a light meal in the evening when you get home. The key here is to have a light late dinner that is easily and quickly digested and low in calories (carbs, sugar, fat). Enjoy your tasty and satisfying lunch as suggested above, but bring a healthy snack to work instead of a whole packed meal. My fiance and I still make snacks in large enough batches that will last us a full week – although sometimes we do gobble them all up before the week ends in a random appearance of the mega munchies. Think home baked buckwheat banana bread or chewy honey oatmeal cookies with raisins and nuts. Try those recipes or keep it classical and bring some fruit, raisins and nuts to work. When you get home, no doubt you will want to eat something, so prepare something light that your body can easily digest. Something without too many calories but still satisfying. Salads are great for this. And before you say “ewwwwwwww… me no like salad”, give these a go – they are tasty and you’ll feel great afterwards. I’m sure. There is something greatly satisfying about having a proper sized salad for dinner. Are you struggling with late dinners? What are your biggest challenges with eating healthy? Let us know in the comments below, we’d love to help. Colles, S.L., Dixon, J.B., O’Brien, P.E. (2007), Night eating syndrome and nocturnal snacking: association with obesity, binge eating and psychological distress. International Journal of Obesity, 31(11):1722-1730. Cohen, T. (2012), Why those nighttime snacks are bad for us: Eating late DOES make you fat even if you have the same number of calories. Mail Online. Arble, D. M., Bass, J., Laposky, A. D., Vitaterna, M. H. and Turek, F. W. (2009), Circadian Timing of Food Intake Contributes to Weight Gain. Obesity, 17:2100–2102. Gluck, M.E., Venti, C.A., Salbe, A.D., and Krakoff, J. (2008), Nighttime eating: commonly observed and related to weight gain in an inpatient food intake study. The American Journal of Clinical Nutrition, 88(4):900-905. Geliebter, A., Gluck, M.E., Tanowitz, M., Aronoff, N.J., Zammit, G.K. (2000), Work-shift period and weight change. Nutrition, 16(1):27–29. Baron, K. G., Reid, K. J., Kern, A. S. and Zee, P. C. (2011), Role of Sleep Timing in Caloric Intake and BMI. Obesity, 19:1374–1381. Posted in Healthy eating tips and tagged easy lunch, eat healthy, fat, healthy eating tips, healthy snacks, late dinner, late shift, late work, light dinner, recipes, weight gain.